Christian (sobriquet Christel) Bernhard Julius Hamann was born on 27 February, 1870, in Hammelwarden, near Oldenburg, Germany, to Georg Wilhelm Christian Hamann (b. 1834), a border guard and later usher in Ellw端rden, and Catherina Margaretha Louise (b. 1837). It seems Christel Hamann owes his interest in the mechanics and construction of calculating machines to one of his father's friends, namely the W端rzburg Professor of mathematics Dr. Eduard Selling. In 1880s Selling devised a calculating machine of very original construction (see the machine of Selling), and the young Christel was allowed to take part in the building of this peculiar calculating machine. This collaboration with Prof. Selling must be regarded as crucial for the later life of Hamann. Obviously from his youth Hamann demonstrated an extreme talent and energy in technics. As a teenager he attended a local technical school in Bremerhaven, working at the same time as an apprentice-mechanic at the Nautischen Institut bei W. Rudolph in Bremerhaven. Then he worked in Mathematisch-Mechanischen Institut von A. Ott in Kempten, in workshops of Carl Zeiss in Jena and in the workshop of Carl Bamberg in Berlin. In 1896 Hamann became independent by starting his own institute in Berlin—the Mathematical-Mechanical Institute in Berlin-Friedenau. Initially he dealt with the construction of geodetic and mathematical instruments, which he developed after new scientific ideas and also successfully introduced into practice and for which at the 1900 World Exhibition in Paris he was awarded the gold medal. Later Hamann devoted a part of his time in construction of textile machinery, cinematographic, medical and anthropological tools, and miniature steam engines. 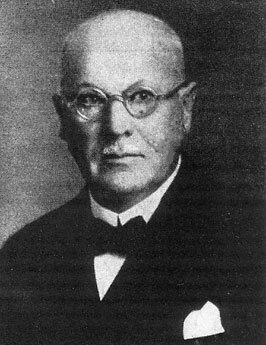 In the beginning of 1900s Hamann however recognized the disadvantages of fragmentation of his interests and decided to concentrate on the construction of the calculating machines. Hamann started to develop his first calculating machines in 1898. Initially he had the intention of using the construction of Selling, which he knew perfectly, and the resulting construction was simple, but not reliable enough. Then he decided to use the stepped drum of Leibniz, developing two very good calculating machines—"Gauss" and "Berolina". In 1903 he designed the so-called proportional system of levers (parallel racks that are proportionally displaced by a lever connected to the racks), which was later used in the famous calculator "Mercedes Euklid". In 1909 Hamann constructed a perfect differential engine (see the differential engine of Hamann), used in the calculation of Logarithmic-Trigonometrical Tables of Bauschinger and Peters. After the WWI Hamann worked for the company Berliner Deutschen Telephonwerke- und Kabelindustrie AG in Berlin. In 1922 he developed a new type of calculating mechanism, so called Schaltklinke (switching-latch-wheel), which the first time allowed an automatic division. The first calculating machine equipped with this mechanism was the four-species calculator "Hamann Manus" from 1925. Further improvements of Hamann were electric drive models, "Hamann, automatic Z, Y and X". The "Hamann Automat V" worked first time with an automatic truncated multiplication. The "Hamann Selecta" was equipped with two full keypads, the new multiplication has already allowed during operation of the machine. Hamann's other inventions include the improved computing machines "Hamann Selecta", "Hamann Elma" and "Hamann Delta", as "Hamann Selecta" has two full keyboards, allowing new multiplications to be performed during ongoing work steps of the machine. In 1933 Hamann was appointed as a honorary doctor of the TH Berlin (Technical University of Berlin). Hamann was married to Hedwig Schindler (1872-1949), the pair didn't have children. Christel Hamann died on 9 June, 1948, in Berlin.